UPDATE: We have a time and location for the Roslindale District Councilor Forum – we will convene for a conversation with our councilors – Councilors Campbell (soon to be Council President), McCarthy, and O’Malley – at 6:30 pm on January 24, 2018, at the Roslindale Community Center, 6 Cummins Highway (corner of Washington and Cummins in Roslindale Square). We encourage attendees to walk, bike, or take the T to the meeting at parking is limited. We were thrilled to see the City of Boston and MBTA test out a trial run of a dedicated bus lane on Washington Street inbound this morning. WalkUP has strongly advocated for the City to implement this bus lane concept along the very congested Roslindale Village-to-Forest Hills corridor. Reports were universally positive — to get some flavor of the community reaction, check out our Twitter feed for dozens of retweets of reactions and photos. We’ve also include a gallery of photos below. Members of the WalkUP Steering Committee were out and about along the route to inform riders of this lane and explain the process behind it. The City plans to test this dedicated lane again next Tuesday, December 19, during the morning commute. Dedicated bus lanes are proven methods for significantly improving bus commute times and encouraging more people to take public transportation. During the morning and evening rush hour, almost 60% of all travelers on Washington St are riding a bus –these riders need a faster way to reach their destinations and go to-and-from the main subway line at Forest Hills. And if the bus lane operates as successfully as it appeared to do, many more are likely to switch to the bus to save time, thus even further increasing the percentage of travelers on mass transit. We should note that we are also very pleased to hear from cyclists who used this dedicated lane today of the ease of their commute and lack of any bus-bike conflict. There was some concern going into the test about this issue, but at least today’s data points suggest the cycling experience will be much improved rather than diminished. We will continue to monitor the cyclist experience in this dedicated lane and believe it can be a boon for bike riders in addition to bus riders. WalkUP will continue its strong advocacy to the City of Boston to implement a full multi-week pilot of this dedicated bus lane in 2018 to fully gauge its effectiveness and effects. The full pilot should consist of a dedicated lane inbound to Forest Hills in the morning and a dedicated lane outbound to Roslindale Village in the evening. We’d really like to make this happen as soon as possible–tomorrow is not too soon! Please contact Mayor Walsh, City Councilor Tim McCarthy, and our At-Large City Councilors (Annissa Essaibi-George, Michael Flaherty, Ayanna Pressley, Michelle Wu) to express your support for this dedicated bus lane and request a full multi-week pilot as soon as possible in 2018. You can also respond to this tweet from BTD or email them at btd@nullboston.gov. It is very important that our city officials hear from us on this. We appreciate their willingness to test this out and want them to know many Roslindale residents support this concept! We look forward to seeing this dedicated bus lane in action again next Tuesday! Snowfall has now exceeded 4″, so we are going to clear our identified key bus stops. Accordingly, tomorrow (12/10) morning at 8:15 am: Meet Matt Lawlor at the northwest corner of Hyde Park Avenue and Cummins Highway (Atlas Liquors). Thanks and hope to see you there tomorrow morning to do some community service! We may have a snowfall that meets our criteria in the next 36 hours. If you’re interested in joining us if that happens, watch this space and our social media outlets on Twitter and Facebook for further information. Thanks! Let’s dedicate a bus lane! For people who want to walk more and drive less in Roslindale, and encourage others to do so as well, the stretch of Washington Street from Rozzie Square to Forest Hills has long been an extreme pain point. The Commuter Rail makes the trip in less than five minutes but is infrequent and too expensive for many. We believe the cost for getting downtown from Roslindale should be the same, or nearly so, whether on Commuter Rail or bus/subway, but changing that will require political will at the state level and so far we’re not seeing much in that direction. Meanwhile, this corridor is well served by buses — nearly ten different lines from points south and west converge here, so in theory the wait should always be short and the one-mile trip to the end of the Orange Line quick. But these buses share a single lane with traffic, making the entire route indistinguishable from a parking lot at rush hour. This isn’t right and it’s time to fix it. The GoBoston 2030 study found that an average of 19,000 bus riders pass along this corridor every day, and more than half the people traveling along Washington Street between Forest Hills and Roslindale Square are in a bus. 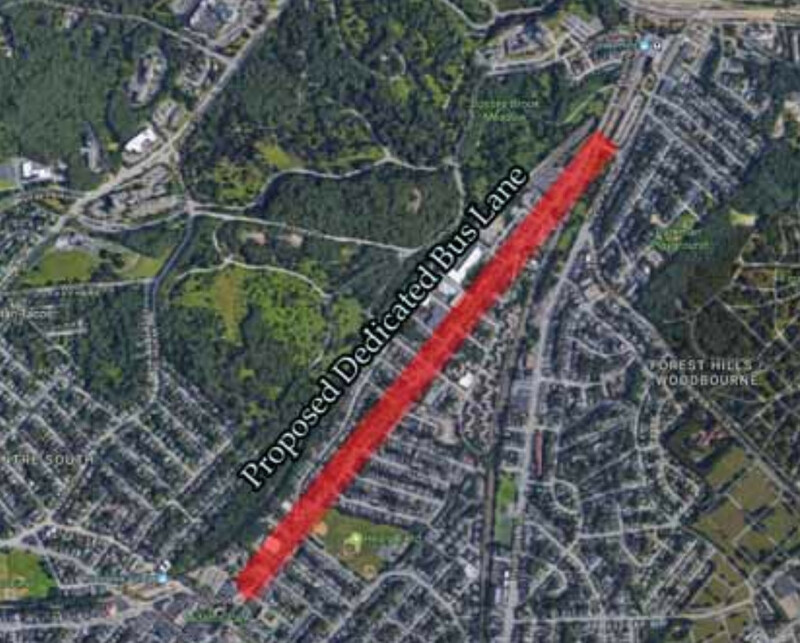 With heavy mixed use development going up around Forest Hills as well as a growing population in Roslindale and points south, this route is only going to become more well traveled, but it’s physically impossible to accommodate hundreds or thousands more people trying to make this trip in single-occupant vehicles. Moreover, if the bus trip were faster and more convenient, it’s near certain that many more would opt for that mode, making it an overwhelming favorite. A potential solution has been on the radar for years and it’s time to give it a try. Several groups, including the City of Boston itself, have proposed removing a lane of parking and turning it into a dedicated bus lane — inbound in the morning, and outbound in the evening. A similar experiment was quite successful last winter in Everett and we’d like to see how it works here. Community feedback on the idea has been overwhelmingly positive thus far and we’re hopeful to get a trial going soon to see how much it reduces the bus commute time, and to gather information on how it might impact other users of the road. Once we have real data in hand, we can have a well-informed conversation about the trade-offs involved in this sort of dedication of our street space. One concern is the bus lane will likely have to be shared with the bike lane. This arrangement works well on the Silver Line route in the South End, but this stretch of Washington Street is much tighter. In some future enlightened world, the City will remove parking on both sides of Washington Street to provide separate dedicated bike and bus lanes for the public good, but short term this project makes imperative the rapid funding and construction of the Roslindale Gateway Path as a completely off-street alternative. We’re also intent on making sure the bus drivers on this route are well-trained and sensitized to the shared use with cyclists to maximize peaceful coexistence. Finally, any loss of on-street parking will inevitably touch a nerve with some. A critical upside of the trial run is that we’ll then have data to inform this discussion: if we can move 20,000 or more people in half the time it currently takes, is that worth sacrificing real estate that is currently dedicated to a few dozen vehicles for free? Moreover, last year the Metropolitan Area Planning Council researched the corridor’s parking patterns, including by analyzing license plate registration of parked cars. They found that “the Washington Street corridor between Forest Hills station and Roslindale Square has the highest rates of bus utilization in the entire MBTA service district, with 60% of travelers utilizing an MBTA bus during the AM and PM peak hours.” The report also documented low parking usage during the peak travel times, especially during the early morning, and that over 80% of parked cars were from outside the neighborhood driven in by people heading to the Forest Hills T-station. If these spots go away, these people from outside the neighborhood (and presumably most from outside the city) will have to find an alternate commute–perhaps this will stimulate a virtuous circle where these people opt for commuter rail closer to their home once their “free” parking alternative is limited. That’s an outcome we at WalkUP Roslindale can support. If you want to help make this happen, spread the word to you neighbors and reach out to your City Councilors and the Mayor to express your support. We’re optimistic there will be good news about the trial run soon. Boston Globe 11/24/17 – The T wants parking lanes for buses. Will Boston give them up? Livable Streets – Want Better Bus and Trolley Service? Talk To Your Mayor!